TORONTO, March 26, 2018 /PRNewswire/ - Jaguar Mining Inc. ("Jaguar" or the "Company") (TSX: JAG) is pleased to announce an increase in gold production at the underground Pilar Mine ("Pilar"), expected to continue for the next 36 months. Pilar is part of the Caeté Complex that also includes the underground Roça Grande Mine ("RG") and mill operation that processes ore from both mines. As part of refocusing its resources on Pilar and Turmalina Gold Mine ("Turmalina"), as well as exploration growth activities, the Company made a strategic decision to temporarily suspend its Roça Grande mine operations. Rodney Lamond, President and CEO of Jaguar Mining commented: "We are now seeing the benefits of the significant investment we made in growth exploration projects over the last 24 months at our core operating assets of Pilar and Turmalina. Pilar's increasing grade profile and greater gold ounces per vertical metre have positioned the mine to deliver strong production growth over the next 36 months, approximately 55,000–60,000 ounces annually, nearly double its production in 2017. Capital spending during this period is also forecast to remain stable as a significant amount of development has already been completed. Over the past two years, Pilar has completed 4.53 kilometres of primary waste development and 3.85 kilometres of sub-level ore development. We recognized an opportunity to turn Pilar's operations into a high performing mine and took the necessary steps to deliver on that opportunity. We continue to invest in growth projects at Pilar given the significant upside potential that still exists." "With our higher cost Roça Grande mine on care and maintenance, we are working to strategically rebuild this mine for the future. As we have done with our other assets, we will focus on very promising growth exploration projects that will prove up existing mineral resources and provide a more complete understanding of unknown mineral resources to ensure our investment continues to provide a strong return." "For 2018, we now expect Pilar's gold production to increase to between 39,000–47,000 ounces, offsetting the reduction of ounces from the RG Mine. We are maintaining the overall Company's annual production guidance between 90,000–105,000 ounces for 2018." Following the recently updated Mineral Resources and Mineral Reserves for Pilar, the Company has confirmed it expects an increase in production growth over the next 36 months. This increase is the result of strategic investment in exploration and infill drilling over the last year, which has significantly increased the ounce per vertical metre profile below the current mining horizon. The increasing grades and profile of ounces per vertical metre will allow the mine to gradually increase gold production without significantly increasing the capital investment to deliver these ounces. An increase in the mining fleet is expected in 2019 with an additional two 30-tonne haulage trucks and one additional fandrill for stoping. Back in January 2016, the Company initiated an accelerated waste development program at Pilar that focused on deepening the main ramp to access into the newly discovered BFII orebody. The Company hired a mining contractor to focus on completing the development work to increase overall mining capacity of the mine. Over the past two years, Pilar has completed 4.53 kilometres of primary waste development and 3.85 kilometres of sub-level ore development. In addition to the investment in underground development over the past two years, the Company completed 6,268 metres of growth exploration drilling, which successfully confirmed the down plunge extension of the main BFII and BF orebodies at Pilar, 300m vertically below the current mining infrastructure. In March 2018, the Company reported Total Measured Resources increased 277% to 317,000 ounces of gold, net of depletion, grading 4.47 g/t. Total Measured and Indicated ("M&I") Resources increased 10% to 532,000 ounces of gold, grading 4.37 g/t. Inferred Resources increased 104% to 433,000 ounces grading 5.69 g/t, reflecting a successful growth exploration drilling campaign in 2017 targeting high-grade deeper extensions to the principle banded iron formation orebodies (BFII, BF, and BA) below current mine production levels. Higher quality and increased grades of newly added mineral resources facilitate resource-to-reserve conversion drilling to be prioritized in 2018 and scheduled as per the mine plan, while ensuring financial discipline. 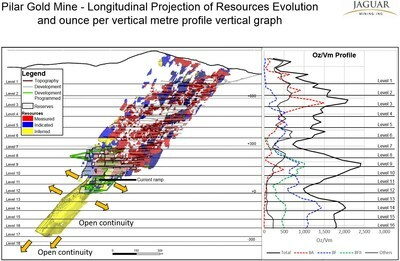 In addition, ounces per vertical metre have shown a strong increase across the orebodies resulting from the infill and growth exploration drilling (shown in Figure#1 and Figure#2). The increase in resource and ounce per vertical metre at Pilar supports the forecast increased gold production from its current guidance of 43,000–48,000 ounces in 2018 to 55,000–60,000 ounces per year by 2020. Q1 2018 includes production from Roça Grande Mine. The Company has made the difficult decision to temporarily suspend production at Roça Grande Mine, and will commence a growth exploration program in the area. RG is located adjacent to the Caeté processing plant and has been supplementing feed from Pilar. Over the last few years, work has been focused on mining the end of the known resource on the orebodies RG01 and RG07 while infill drilling continued to expand the resources. Due to these conditions, production has decreased resulting in significantly increased cash costs at unsustainable levels above the average realized gold price. The Company has planned to commence a broader Regional Growth Exploration program in order to get a complete understanding of all the orebodies in the region, which will allow management to properly plan the restart of mining with sufficient reserves and resources to be financially viable. The Company has been successful in acquiring concessions around RG (see press release June 21, 2017), bringing total concession to 1,000 hectares. This concession includes areas where there has already been underground mining work on RG01 and RG07 orebodies, and open pit mining on RG 02E, RG 02W, RG03, RG05 and RG06 orebodies. 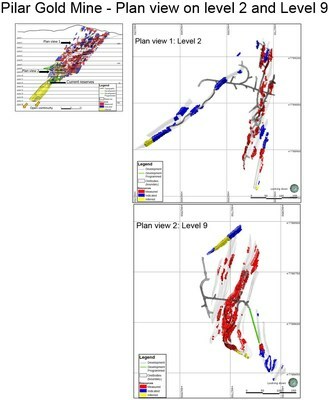 The licensed area contains a number of strategic exploration targets including the highly prospective Morro da Mina target, which forms part of the Banded Iron Formation ("BIF") continuity running through the concession hosting the mineralization that makes up the RG complex. Scientific and technical information contained in this press release has been reviewed and approved by Jonathan Victor Hill, BSc (Hons) (Economic Geology - UCT), Senior Expert Advisor Geology and Exploration to the Jaguar Mining Management Committee, who is also an employee of Jaguar Mining Inc., and is a "qualified person" as defined by National Instrument 43-101 – Standards of Disclosure for Mineral Projects ("NI 43-101"). The Caeté Complex is composed of the Roça Grande and Pilar Mines and the Caeté Plant. It is located in the municipalities of Caeté and Santa Bárbara, in the state of Minas Gerais, Brazil, and is approximately 50 kilometres from Belo Horizonte, the capital city of the state of Minas Gerais. Jaguar Mining Inc. is a Canadian-listed junior gold mining, development, and exploration company operating in Brazil with three gold mining complexes, and a large land package with significant upside exploration potential from mineral claims covering an area of approximately 64,000 hectares. The Company's principal operating assets are located in the Iron Quadrangle, a prolific greenstone belt in the state of Minas Gerais and include the Turmalina Gold Mine Complex and Caeté Gold Mine Complex. The Company also owns the Paciência Gold Mine Complex, which has been on care and maintenance since 2012. Additional information is available on the Company's website at www.jaguarmining.com. Certain statements in this news release constitute "forward-looking information" within the meaning of applicable Canadian securities legislation. Forward-looking information contained in forward-looking statements can be identified by the use of words such as "are expected," "is forecast," "is targeted," "approximately," "plans," "anticipates," "projects," "anticipates," "continue," "estimate," "believe" or variations of such words and phrases or statements that certain actions, events or results "may," "could," "would," "might," or "will" be taken, occur or be achieved. This news release contains forward-looking information regarding the development of the Pilar Gold Mine, the reserve and resource estimates for the Pilar Gold Mine and the assumptions and parameters related thereto, the expected mine life and anticipated gold production. The Company has made numerous assumptions with respect to forward-looking information contained herein, including, among other things, assumptions about the availability of financing for exploration and development activities; the estimated timeline for the development of the Pilar Gold Mine; the supply and demand for, and the level and volatility of the price of, gold; the accuracy of reserve and resource estimates and the assumptions on which the reserve and resource estimates are based; the receipt of necessary permits; market competition; ongoing relations with employees and impacted communities; and general business and economic conditions. Forward-looking information involves a number of known and unknown risks and uncertainties, including among others the uncertainties with respect to the price of gold, labor disruptions, mechanical failures, increase in costs, environmental compliance and change in environmental legislation and regulation, procurement and delivery of parts and supplies to the operations, uncertainties inherent to capital markets in general and other risks inherent to the gold exploration, development and production industry, which, if incorrect, may cause actual results to differ materially from those anticipated by the Company and described herein. Accordingly, readers should not place undue reliance on forward-looking information. Neither the TSX Exchange nor its Regulations Services Provider (as that term is defined in policies of the TSX Exchange) accepts responsibility for the adequacy or accuracy of this release.